ERCC member Barrhead Travel has been presented with a Parliamentary Motion in recognition of their dedication to the charity efforts undertaken by their employees. Tom Arthurs, MSP for Renfrewshire South, lodged the motion after reading about Barrhead Travel’s successful fundraising campaign for Just a Drop which raised £9000 for a fresh water tank in a primary school in Songeni, Kenya. Employees across the business devised a calendar of activity to raise money for the fresh water and sanitation charity. From running marathons to hosting race nights, each branch arranged their own fundraising missions and encouraged their customers to get involved. This year, Barrhead Travel pledged their continued support for the charity and will aim to triple their fundraising in 2019 in order to build a health centre for a village in Uganda. 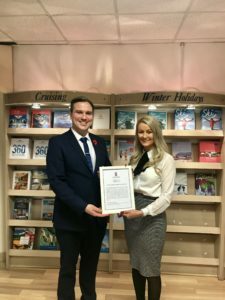 The travel agency, which has 73 locations across the UK, was also commended for its overall commitment to charity and work within the communities in which they serve. Each member of staff has one paid day per year for volunteering for a charity or giving back to their local community. “Charity work is a huge part of life at Barrhead Travel and we feel very fortunate to be in a position where we can give back. For as long as we have been in business, it has always been important to us to support communities both at home and away. Next Next post: Green Power National Race – Looking for Local Business Support!